This year's Turner Memorial Lecture will be given by Dr Peter de Clercq, on 'The travel journals of Balthasar de Monconys and Zacharias Conrad von Uffenbach'. The lecture will introduce two early-modern Europeans with an insatiable curiosity for the world of learning in the widest sense. 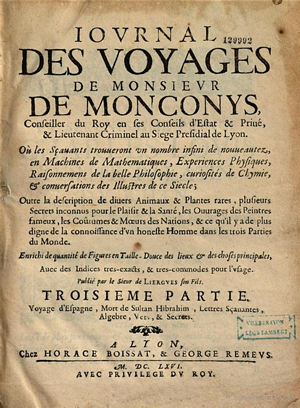 Balthasar de Monconys (1608–1665), a French diplomat, travelled to Portugal, England, Germany, Italy, the Netherlands and the Near East. The German book collector Zacharias Conrad von Uffenbach (1683–1734) made an intellectual foray through northwestern Europe in 1709-11. Their illustrated travel journals, published in multi-volume editions soon after their deaths, are a valuable source of information for historians, including those with a special interest in science and scientfic instruments. The Lecture will be held at the Society of Antiquaries on 27 November. It is free and open to all, no booking is required. If you wish to attend the accompanying wine reception and buffet, please check the September Bulletin for more details and the application form.